Give an extra message to anyone who has renewed with the same insurer four or more times saying: "You have been with us for a number of years. You may be able to get the insurance cover you want at a better price if you shop around." Seven months into the new system, the regulator said there had been "several examples of firms who have failed to comply fully with the rules". "Consumers may have lost out as a result. For example, some firms obscured the required information or did not place the information in a prominent position," it said. Steven Murdoch, from London, complained to John Lewis Insurance that there was not a like-for-like comparison on renewal documents for home insurance.It gives last year's premium in bold after the extra cost of paying monthly direct debit is added, but the new quotation has the price in bold before the direct debit charge is added. 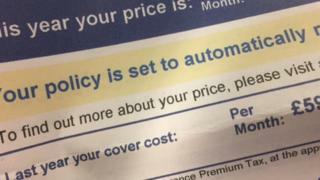 "It looks like the premium is about the same, when in fact it's an 8% increase," he said.The extra charge is shown in less prominent type.He and his wife felt they had lost trust in the insurer, and switched to a different provider, but others may have encountered the same issue.A spokeswoman for John Lewis Finance said: "We acknowledge that the presentation could be improved and we are currently in the process of amending to ensure we are being as transparent and comprehensive as possible. We apologise for any confusion caused." Two firms - Admiral and M&S Insurance have written to customers explaining their mistakes. Admiral - one of the largest insurers in the UK and a FTSE 100 company - gave last year's quoted premium, before discounts were applied, rather than the amount that the customer actually paid. M&S had not used the correct wording in its four-year renewal offer for some customers.There are more cases and the regulator has said it will work with insurers, but could use its powers to fine and order compensation to be paid, if firms fail to comply. However, the FCA could have avoided some of the failures.During consultation prior to the new rules being implemented, it was suggested to the FCA that it should be more prescriptive in how and where the old premium and shop around message were displayed.The FCA's own trial showed that frequently customers overlooked details in renewal notices. With one insurer in the trial 28% of customers read the renewal letter in detail and 44% skim read, or read the first page. At a second insurer, 23% read the letter in detail and 39% skim read, or read the first page.Although the regulator pointed to this research, it did not stipulate precisely where the information should be put, nor the exact wording.In some cases, the previous year's premium and shopping around information have been placed on pages three or four of renewal notices, with the new quotation on the front.